If you want to make homemade bread, rolls, and so forth, then you need to know how to do it in an hour. It’s all about the yeast. Fifteen years ago I attended a class on making whole wheat bread. It’s because of this yeast. This is called SAF-Instant Yeast. Most grocery stores don’t carry it, but they should. It is actually cheaper than the yeast you buy at the grocery store, like Red Star, and it’s 100 times better. It’s more potent than active dry yeast. Let me tell you a little bit about how to use this stuff. Because friends always share the best tips with their friends. 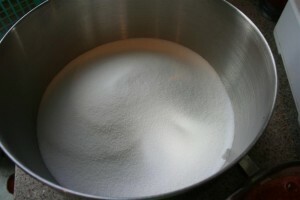 Forget about warm water, yeast, and sugar in a little bowl, and hoping that the yeast is good. Forget about worrying that your water was too warm. 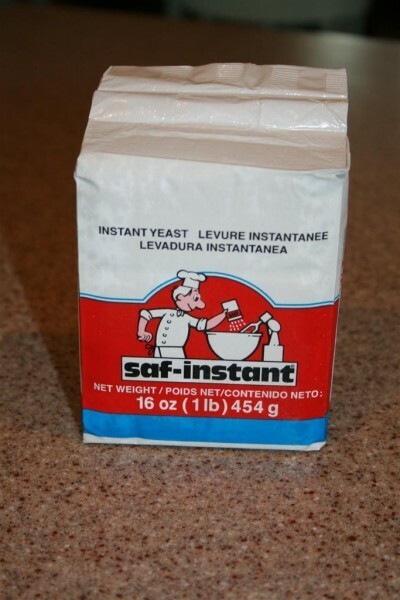 SAF yeast just goes into the recipe with the flour, like any other ingredient. You store it in your freezer. It goes directly into your recipe from the freezer. It will keep for years in your freezer (I am currently using one I’ve had for 4 1/2 years and it is perfectly fine.) This means you can buy it in bulk and store it for a long time if you want to. Forget about waiting for dough to double in size, or giving it an hour to rise. Try giving it 10-15 minutes. This stuff is good. It’s really that good. I honestly don’t think you can mess it up. It’s so easy, simple, and fast. 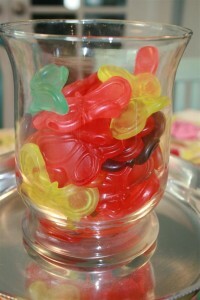 And did I mention that it’s much cheaper per batch than the other kinds? I store mine in a quart size freezer bag once it’s been open. This is what it looks like. Just regular old yeast. But it will revolutionize your baking. It can be substituted for any other kind of yeast in any other recipe. I like to use this handy little shot glass measuring cup because it has both tablespoons and ounces on it. I’ve found that some recipes measure yeast in ounces and some do it in tablespoons, so this lets me measure quickly. 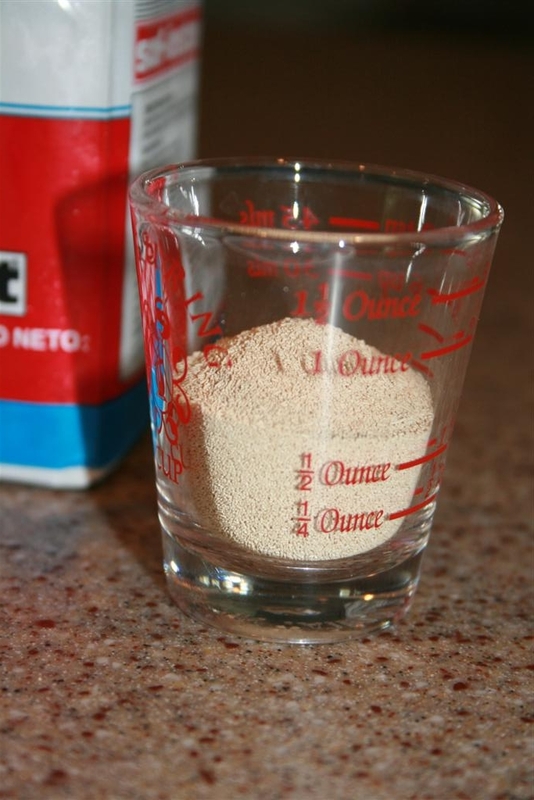 You might like to know that 1 packet of yeast is 2 1/4 teaspoons. 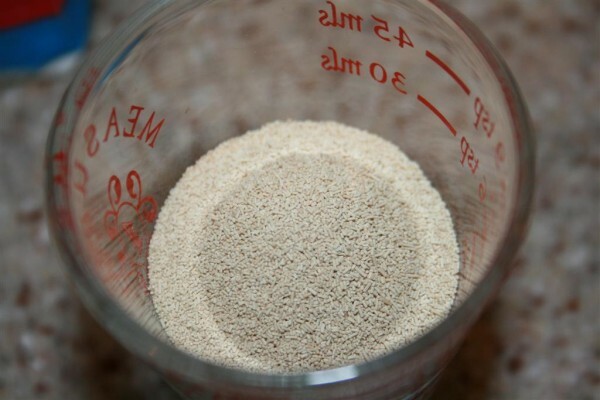 Some people say that if you’re substituting with SAF yeast, you can reduce the yeast by 25%, or in other words, use 1 3/4 teaspoons as a substitute for 1 packet of active dry yeast. If that’s too confusing for you, then just use the equivalent of whatever your recipe calls for. With that said, go get some! 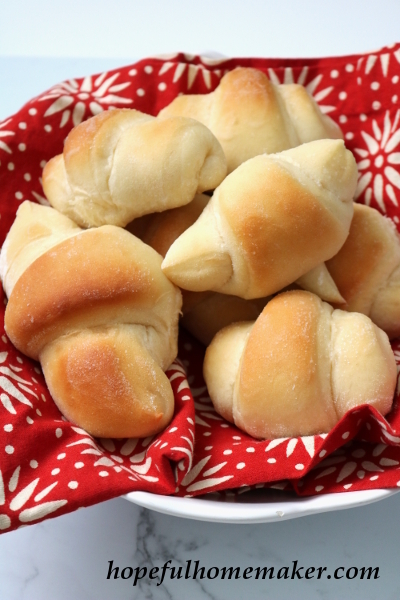 And then make these homemade rolls. I walked into a little candy shop in a nearby town. And they had something they didn’t have the last time I’d been there. 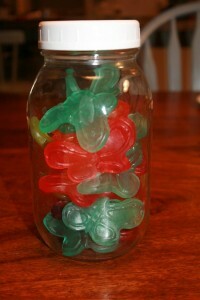 Gummy butterflies that smelled delicious. 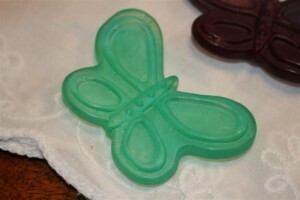 Gummy butterflies in beautiful springtime colors. I had to have some. her friends and their mothers. They were gone in a blink. So I had to have some more. I mean, think of the potential! I’m just sure there’s something amazing waiting to happen with these adorable things. When I said they were big, I meant it. Their wing span is 2 1/2 inches! Last weekend I went and got some for my friend whose husband and boys were going camping so that she and the girls could have something fun to try on their girls night in. Yep. Right now they’re my favorite candy. Except I don’t want to eat them. I just want to look at them. I just poked around online a little bit, and found them for you. If anyone does something amazing with them, I want to see it! Enjoy! 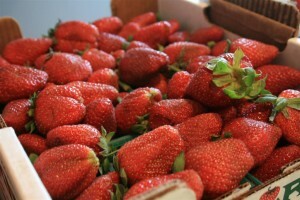 It’s strawberry season, and I can’t think of a more welcome taste right now. 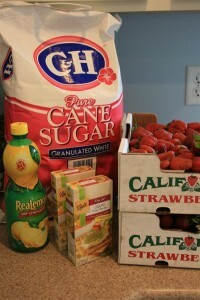 Time to make some strawberry freezer jam. My family loves this stuff. Last year I made enough freezer jam that we’ve had homemade jam to eat all year long. It’s been great, and I have every intention of doing it again this year. 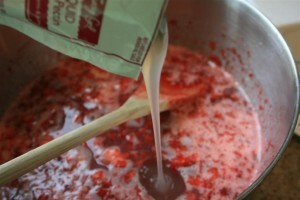 I’m making my jam today using the basic recipe that comes in the pectin box. Last year I discovered liquid fruit pectin. Today I’m using Ball liquid fruit pectin, which comes in a box with two pouches. 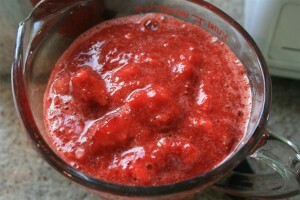 Pretty simple: pectin, lemon juice, sugar and strawberries. and now they’re washed and ready for another round. 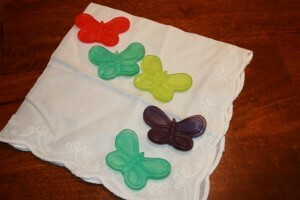 These, too, are made by Ball and can be found at many supermarkets or stores like WalMart. So, here we go. First, wash your fruit. Now, on this next step I will freely acknowledge that the proud recipe developers at Ball, not to mention my great-grandmother, would probably be ashamed of what I’m about to do. But I’m trying it anyway, because I have dinner to make and soccer practices to get to. 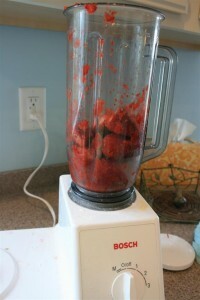 I cut off the tops and plopped the strawberries in my blender. 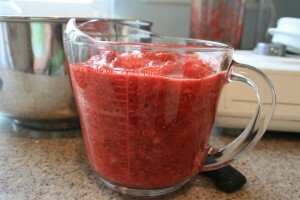 Then I turned my blender on low and let it run just until there weren’t any more whole strawberries. They aren’t completely pureed. There are still chunks. And as far as I’m concerned, I’m happy to have just taken 2 minutes to eliminate a 20 minute cutting and mashing job. 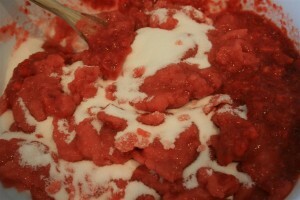 You need two cups of crushed strawberries. And a mixing bowl with four cups of sugar in it. 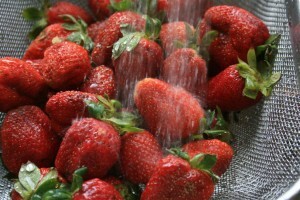 Pour the strawberries into the bowl of sugar and mix thoroughly. When it’s all mixed together, set the bowl aside and set your timer for ten minutes. 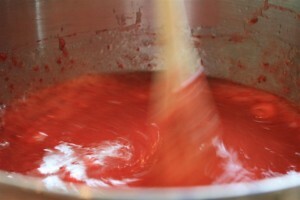 After the ten minutes, add one pouch of liquid fruit pectin to the bowl. And add 2 tablespoons of lemon juice. My daughter liked taking that picture. 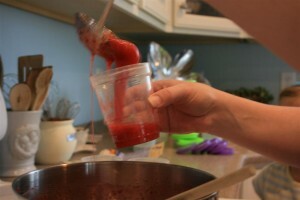 After three minutes, ladle the jam into containers. 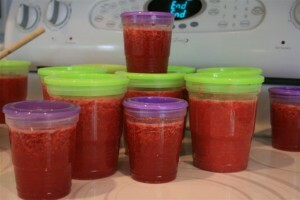 Remember to leave about 1/2 inch headspace at the top of your container so the jam has room to expand when it freezes. 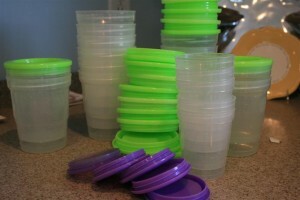 Wipe any drips off the container with a damp towel, put the lids on, and you’re set! 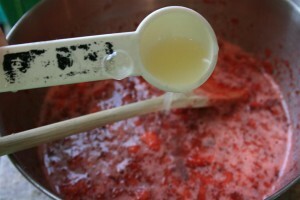 Here’s an important reminder: use whatever measurements (sugar, lemon juice, crushed strawberries) come in the instructions for the pectin you choose to use! No matter what you choose, enjoy! It will be delicious! Yum! Now I’m craving some homemade bread!